We’d love your help. Let us know what’s wrong with this preview of Letter to a New President by Robert C. Byrd. United States Senator Robert C. Byrd is the longest-serving member of the United States Senate in the history of our great Republic. Senator Byrd has served the people of West Virginia, and the nation, for fifty-four years, and has served alongside eleven Presidents. He was twice elected by his colleagues to the position of Senate Majority Leader and currently is chairman of the powerful Senate Appropriations Committee. Byrd has lived through two world wars, the Great Depression, the civil rights movement, the Cold War, the resignation of a U.S. President, the 9/11 terrorist attacks, and traumatic military conflicts around the globe, including Iraq and Vietnam. Byrd has been a witness to it all. And now, in his ninetieth year of life, he wants to share the commonsense lessons he has learned from his unique vantage point in history. In Letter to a New President, Byrd recounts lessons drawn from his remarkable life as a young boy growing up poor in the coalfields of southern West Virginia to his meteoric rise to the pinnacles of power in Washington, D.C. From his unique vantage point in history, Byrd focuses his observations on underappreciated and seldom discussed virtues like personal responsibility, careful consideration before making decisions, and a sense of decency and fairness even toward fierce opponents. A student of history and a defender of our Constitution, Byrd looks to the past for lessons and, in Letter to a New President, studies present failures as guides for constructive lessons for the future. This book will help the next President grapple with the heavy demands of the office. Every American who cares about where this country is heading will find rich wisdom in Byrd’s sage advice. To ask other readers questions about Letter to a New President, please sign up. Letter to a New President by Senator Robert Byrd was a gift given to me by a former student I worked with at WT, Kyle. Kyle's hero was Senator Byrd and in respect to him I moved this book to the top of my list of books to read. I recently completed the book and was surprised by several things. First, I expected this book to be mostly about the Senator, which it was not. I also did not expect for this book to very good, but I was pleasantly surprised by this book. I found this book to be extremel Letter to a New President by Senator Robert Byrd was a gift given to me by a former student I worked with at WT, Kyle. Kyle's hero was Senator Byrd and in respect to him I moved this book to the top of my list of books to read. I recently completed the book and was surprised by several things. First, I expected this book to be mostly about the Senator, which it was not. I also did not expect for this book to very good, but I was pleasantly surprised by this book. I found this book to be extremely interesting and insightful. It was both practical and philosophical. It was a very useful set of ideas to reflect upon (also the specific topic of the final chapter of the book). I was surprised by the specificity, as well as, the intensity of Senator Byrd's criticism of President George W. Bush, as well as, his strong praise for President Harry Truman. I enjoyed this book more for the Senator's long life experience and wisdom gained through reading good books than his political views. Not that the political slant wasn't interesting also, just that I was impressed with how well-read the Senator is and how he applies the lessons he's learned in his life to his service to our country. I read this book and wrote this review in August of 2008, when George W. Bush was still in office and we did not yet know who our next president would be. America had not yet been introduced to "hockey mom" Sarah Palin, and we were still a month away from knowing about Lehman Brothers' bankruptcy (the start of the financial meltdown). Senator Byrd was alive then, still carrying his red-leather-bound copy of the U.S. Constitution in his breast pocket and giving his colleagues hell. Still, this bo I read this book and wrote this review in August of 2008, when George W. Bush was still in office and we did not yet know who our next president would be. America had not yet been introduced to "hockey mom" Sarah Palin, and we were still a month away from knowing about Lehman Brothers' bankruptcy (the start of the financial meltdown). Senator Byrd was alive then, still carrying his red-leather-bound copy of the U.S. Constitution in his breast pocket and giving his colleagues hell. Still, this book is valid today. I was reminded I wanted to buy this book when I read a review accusing Robert Byrd of focusing on tearing down George W. Bush and "name-calling." This did not sound like the Robert Byrd I've been watching defend our blessed U.S. Constitution for almost my entire adult life, but I wanted to see for myself. Beyond cautions to the new president, whether Republican or Democrat, about what "he or she" will inherit from George W. Bush, I found this book to be a very balanced, long-sighted view of the history of this nation and the principles on which it was founded. Stating the truth of where we now stand is not "name-calling"; the reality is that the Bush/Cheney administration and its enablers have very seriously undermined and damaged America and her Constitution. We the People, her lifeblood, have become so perilously anemic and "unmoored" from history and reality that the U.S. citizenry is hardly capable of the kind of debate and reflection required for self-governance. And yet we have little trust in our leaders. 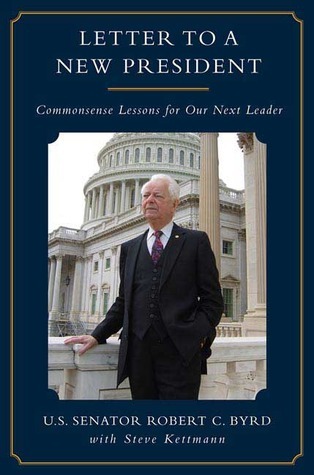 Senator Byrd lays out a number of important approaches the new president must take to restore the confidence of the American people in her leaders and--most importantly--themselves as citizens who, in the final analysis, must be informed enough to self-govern, as the Founding Fathers intended. 1. Bring back the fireside chat. 2. Teach the people about the Constitution. 3. No life stands outside history. 4. A big lie is still a lie; tell the truth. 5. Build your presidency around accountability. 6. Let the press do its job, even when that might sting. 7. We can do better than photo-op diplomacy. 8. A new approach to the rest of the world: influence. 9. Less partisan warfare, more real debate. 10. Don't forget the basics: Have the patience to reflect. Each section includes the rationale for why that approach is critical to this nation's survival. The book is full of the thoughts and actions of presidents and other leaders during our long history--the good, the bad, and the ugly. Throughout, Senator Byrd urges an awareness of the fact that history does repeat itself, and how. "I was considered stubborn in some quarters and eccentric in others when I flew to the Soviet Union in 1979 to meet with Soviet Premier Leonid Brezhnev in my role as Senate Majority Leader. I went to reinforce upon him the constitutional importance of giving the Senate ample time to thoughtfully review an important nuclear-arms treaty of the day, SALT II.... By the end we had reached an understanding. I drank a toast to him, and he toasted me, too. Brezhnev understood that he must respect the role of Congress and give us time for thorough consideration of the treaty." If only George W. Bush had had the same respect for Congress (and they for each other and for the American people) instead of bums-rushing them into authorizing him to invade Iraq right before the 2002 mid-term elections! Many thousands of lives and many billions of taxpayers' dollars might have been far better spent. Senator Byrd's perspective on history and governance is wide and deep, tempered by decades of struggling to stay true to his moral sense and calling as he has fought tirelessly to protect and defend the U.S. Constitution. Unlike many, he has demonstrated the capacity to take time to think, to change, to grow. I will always remember him pulling that little red copy of the U.S. Constitution out of his breast pocket on the Senate floor. I hope the next president will also carry one, not as a prop but as a reminder as Byrd does, ever-mindful of its import. It must be for Senator Byrd--and for any American who is informed enough to understand the implications of the last eight years--terribly saddening to think he may not live long enough to see a new president rouse us all once again to fight for our country's heart and soul: our hard-won Constitution and rule of law; our honesty, integrity, humility, values, and transcendent ideals. His heart must be breaking a second time now. No matter what people think about the reasonings and politics of West Virginia Senator Robert C. Byrd, he is one of our nation's leading authorities on the U. S. Constitution. This book, written during the last Presidential campaign, is a letter to an upcoming President about the importance of the office he or she will be holding,the requirements of the office, as set forth by the leading law of our country, The U. S. Constitution, and the integrity involved both within our country and to the wo No matter what people think about the reasonings and politics of West Virginia Senator Robert C. Byrd, he is one of our nation's leading authorities on the U. S. Constitution. This book, written during the last Presidential campaign, is a letter to an upcoming President about the importance of the office he or she will be holding,the requirements of the office, as set forth by the leading law of our country, The U. S. Constitution, and the integrity involved both within our country and to the world as a whole. 1) Don't be like Bush, because he was very bad. 2) I knew basically every statesman since Hoover. 3) When you don't know what to write in a book about political science....quote Jefferson or someone else from the 18th century. What an amazing book. I read it before Obama's first inaugural speech. I think he actually plagarizes from it a times. Letters by Senator Rober C. Byrd, the longest-serving memeber of the Senate. Robert Carlyle Byrd was a United States Senator from West Virginia, and a member and former Senate Leader of the Democratic Party. Byrd was a senator from January 3, 1959, until his death, and was the longest-serving senator, as well as the longest-serving member in congressional history. He was the Dean of the Senate from 2003 to 2010. He was also the oldest member of the current Congress at the Robert Carlyle Byrd was a United States Senator from West Virginia, and a member and former Senate Leader of the Democratic Party. Byrd was a senator from January 3, 1959, until his death, and was the longest-serving senator, as well as the longest-serving member in congressional history. He was the Dean of the Senate from 2003 to 2010. He was also the oldest member of the current Congress at the time of his death (Strom Thurmond was the oldest to serve in Congressional history), and was the first person to serve uninterrupted for half a century as a senator. Byrd was President pro tempore of the United States Senate from 2007 to 2010, a position that put him third in the line of presidential succession, behind Vice President Joe Biden and House Speaker Nancy Pelosi. He also held this post previously from 1989 to 1995, briefly in January 2001, and from June 2001 to January 2003. Byrd held a wide variety of both liberal and conservative political views. He also held many leadership positions: Senate Conference Secretary, Majority Whip, Minority Leader and twice Majority Leader.